Tackling stubborn dirt and ingrained stains requires tough cleaning products, but it’s important to ensure that the active ingredients get to work on the marks and not your skin or the rest of your body. There are a number of precautions you should take before starting any cleaning task, whether it is at home, work or elsewhere. These will ensure that you don’t damage your health while getting the job done. Different types of cleaning jobs will require various active ingredients, with some of them being more dangerous than others. It’s therefore a good idea to take a look at the label and understand what it means before you start. The problem is that most cleaning products don’t list the ingredients, but you can learn a lot from the labels. Those that are emblazoned with the words ‘warning’, ‘danger’ or ‘caution’ are the ones you should be most careful about, especially if you’re using it undiluted. If there is a recommended way to use the product on the label it’s best to stick to these instructions. 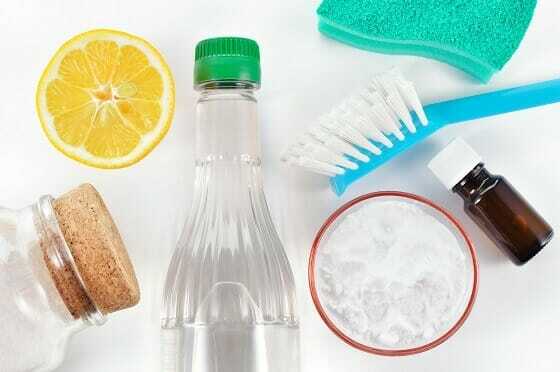 In some circumstances you can use natural or household products, with things like vinegar and essential oils working for cleaning down surfaces. Other tasks, such as cleaning the oven or the drain will require corrosive chemicals that can be dangerous. Ingredients to look out for include chlorine and ammonia, which can irritate the skin, as well as butyl cellosolve. Be especially careful if you see these listed on the packaging, making sure they’re kept away from the skin and eyes. While you can’t get psoriasis from cleaning, irritant dermatitis is more of a concern. It means an inflammation caused by something in the environment and in this case it could be detergent or solvents found in the cleaning products. One of the problems is that these substances can strip the natural oils that are usually found on the surface of the skin. Regular and prolonged contact can lead to discomfort and a long-term skin condition. 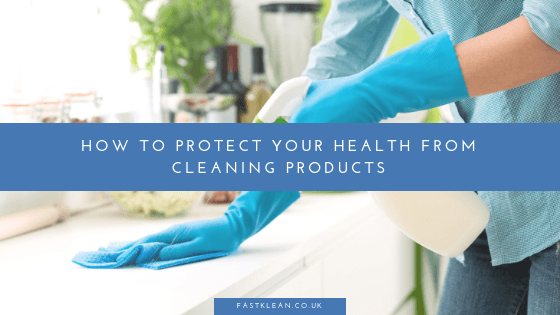 It’s a good idea to use plant-based cleaners when you can, but in the circumstances that it’s not possible it’s always advisable to wear gloves. Traditional washing up gloves tend to offer more protection than the disposable variety, as they are thicker and extend further up the arm. When using powerful cleaning products be sure to keep the area well ventilated. This can be as simple as opening a window and not closing it for a while even after you have removed all traces of the product. If you do get anything on your skin then it is important to absorb it with a cloth and rinse carefully. If there are any signs of irritation after the initial incident then it’s a good idea to follow up with your doctor. All-purpose cleaner – mix half a cup of vinegar, 2 tbsp. baking soda and 10 drops essential oil of your choice. Shake these 3 ingredients in a spray bottle and you have yourself a versatile and chemical-free all-purpose cleaner. Tile cleaner – making your own tile cleaner free of contaminants is now possible. You need half a cup of baking soda, liquid castile soap of your choice and 5-10 drops essential oil of your choice. Get the baking soda in a mixing bowl and pour in the castile soap while stirring the mix. Add the essential oil and you have a tile cleaner potent enough to remove even the toughest of gunk. Shower and tub cleaner – if you need a more specialised cleaner to address trouble in the bathroom, this recipe works perfectly. You need 1 part white vinegar and 1 one part dishwashing liquid mixed together in a spray bottle. Spray on the shower area and tub, let it sit and then scrub. Window and glass cleaner – a window/glass cleaning solution that doesn’t trigger allergies or any other adverse health reaction effects is the ideal cleaner to use. To make it you need a quarter cup of vinegar, half tsp. liquid dish soap, 2 cups of water and – the secret ingredient – 10 drops of orange essential oil. Put all ingredients in a spray bottle and shake well. Spray onto the window/glass surface directly and use a microfibre cloth to wipe it off. The cleaners at FastKlean are all professional and know how to handle products properly, They can clean your domestic or commercial property thoroughly and without any burden for the environment. That is why we have a cleaning service dedicated to using nothing but all-natural products: vinegar, baking soda, lemon and lemon acid, etc. We strongly believe that this type of cleaning is a huge leap towards a greener tomorrow and so we are planning on developing it even further. How do you protect yourself when cleaning? Let us know in the comment section below. Antoaneta has been editing FastKlean news articles since 2001. Highly experienced, passionate and proactive professional. She is managing, motivating, training and developing, a successful and productive team and thrives in highly pressurised and challenging working environments. Antoaneta has strong attention to detail and ability to help others improve their performance. Hi Sarah, thank you for your comment. We’re glad to hear that you enjoyed our blog and found it informative. We have very interesting blog posts coming very soon. Stay tuned. Google + FastKlean is one of top cleaning companies in London.